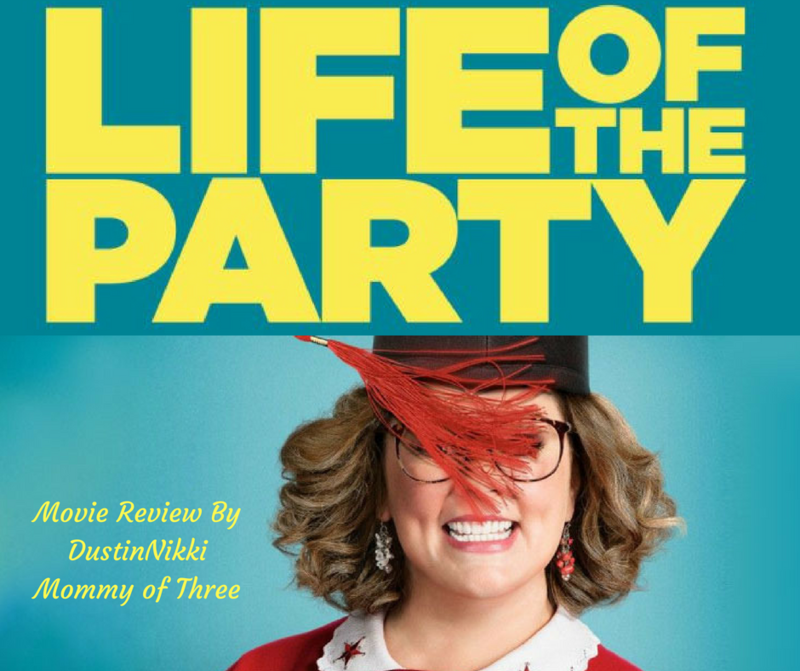 Have you seen Life of the Party starring Melissa McCarthy yet? 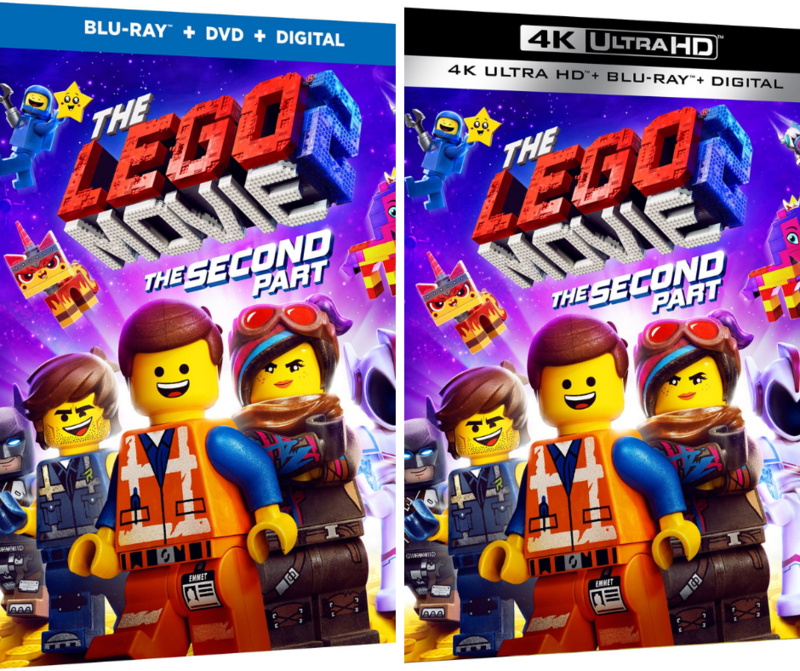 It is now on Blu-ray/DVD. The DVD release was on August 7th. I was really looking forward to seeing this movie because I love McCarthy. Her movies are usually pretty funny in my opinion. Life of the Party is rated PG-13. 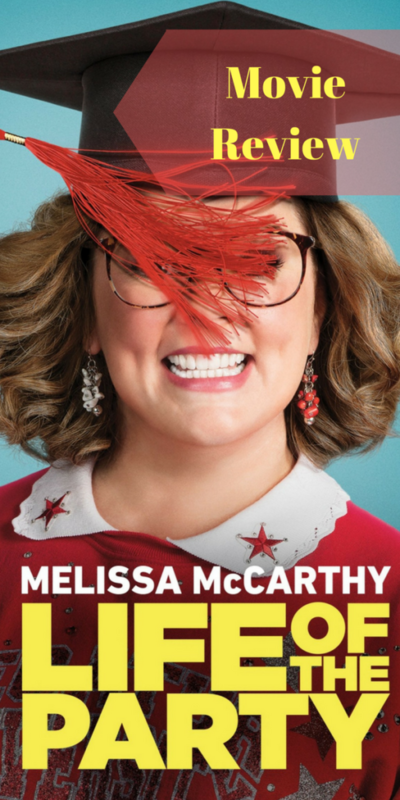 The movie is directed by Ben Falcone starring Melissa McCarthy with Maya Rudolph, Gillian Jacobs, Molly Gordon, Debby Ryan, Heidi Gardner, Matt Walsh, Julie Bowen. Included with the Blu-ray/DVD may include extras such as 80’s Party, Mom Sandwich, Line-O-Rama, Bill Hate-O-Rama, Gag Reel, and Deleted Scenes. I don’t know what the other features are but I did watch the deleted scenes (like I usually do with any movie). I can never pass up a gag reel. 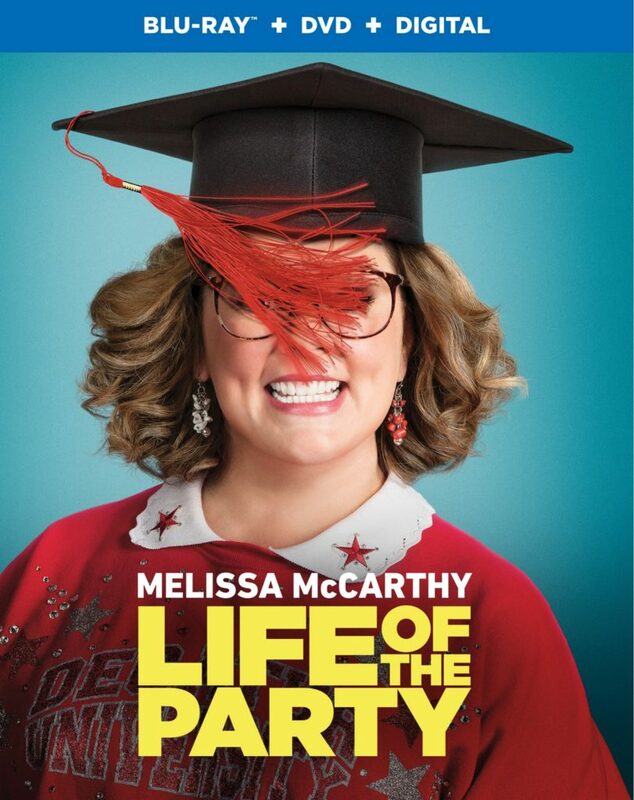 If you want to check out the trailer, see my blog post about the Life of the Party DVD Release. When the movie begins we see Deanna (McCarthy) and her husband dropping their daughter off at school. It’s her last year of college. I immediately get the vibe that this isn’t the typical McCarthy comedy. Her character seems a bit different than her usual over the top hilarity roles. 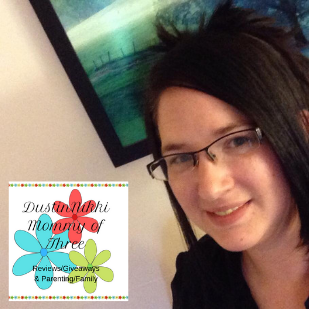 Deanna is a down to earth, kind and gentle mom. She’s just so sweet. Anyway, after she finally breaks away from her daughter and gets into the car with her husband, he drops a bomb. She starts talking to him about their upcoming vacation trip and out of left field he tells her he wants a divorce. There isn’t any background in the movie about their relationship really. He just tells her he has fallen in love with someone else. She’s completely caught off guard and completely hurt. She’s not sure what to do with her life at this point so she decides she’s going to go back to school herself. At first her daughter, Maddie isn’t too thrilled about it. She actually seems pretty annoyed. Deanna gives her daughter space though but her friends want to welcome her rather quickly. Deanna is like a big sister/motherly person to all the girls in the sorority. Her daughter quickly gets over her annoyance too. So that dynamic gets stopped pretty quickly. The poor woman seems to be in the middle of a mid life crisis. Which really she is, her whole life was just turned upside down. She goes through her last year of college hopefully to get her archaeology degree which she gave up when she had her daughter years ago. Maddie helps her fit in and even gives her a makeover. Deanna finds herself in the company of good friends which include her daughter (of course) and all the sorority girls. At one point she even finds herself with a rather young man. 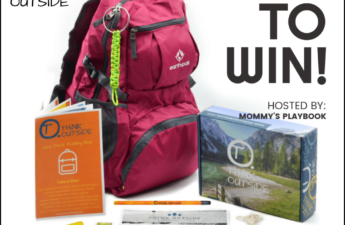 There was some hilarity here when her daughter caught her sneaking out of his room one morning. There are some conflicting feelings there with Deanna. Her young guy wants a relationship but she’s not so sure. I won’t say much more about that because I don’t want to ruin that little comical dynamic. Well, the plot is pretty straightforward and simple. The plot is basically about Deanna making it through her last year of college at age 40 and finally getting that degree. There isn’t much of a backstory about the divorce or anything like that. Her ex-husband’s girl friend is mean. I don’t know why. She just is. Eventually Deanna has to find a way to pay for the rest of her year because her ex and his new wife decided to cut her off. I won’t say what led up to that point though. Deanna was definitely a more calm character for McCarthy to play. This movie was also a bit different than her typical movies. There was a lot of comedy but it was mostly all chuckles. There were a couple instances that were pretty hilarious. I am used to more hilarity and crass humor. But there wasn’t any in this movie. I thought this movie was cute. It was fun to watch and I love a more down to earth comedy with her. I think one of my favorite parts was when they went to an 80’s themed party. Deanna and the girls were dressed for the occasion. I think this was part of the movie where she just shined. Pretty cool dance moves when she dance battled with a mean girl. Yes, there were mean girls in college. But the weird thing is, they weren’t even that mean. College life and the parties were pretty low bar too. You would think college life would be more crazy. The tone of the movie seemed to be pretty tame. I liked it though. The movie was funny regardless, I thought it was cute and sweet. I just love Deanna. There were funny moments, sad moments, heartfelt moments, and moments that just made you simply smile. Even though the comedy was pretty tame and there weren’t very many (if any at all) crass hilarity, I wouldn’t say it’s fun for the whole family. It’s definitely a movie I can watch with my teen daughter though. Have you seen Life of the Party? If so, what did you think? Disclaimer: I was not compensated for this post. However, I received a free review copy of the movie for my review from Warner Bros. Home Entertainment. All opinions are 100% my own.